The development of this flower is very interesting. Years ago I was fortunate to capture the three stages of its life cycle in one photo (the second photo). First, the closed pod appears and inside it the flower develops: suddenly the pod opens and the yellow flower appears. During its flower stage it closes at night and on dark or rainy days, and re-opens the next day. At the final maturity of the flower it closes, and inside the pod the seeds develop, after which it opens one last time and the seed head appears to allow the wind to spread the little parachutes of seeds. I love the design of this one. I’m sure I wouldn’t have noticed it if I were out walking, but with your photos, I can look at the intricate designs and patterns of flowers. Some of them are quite wonderful. They are quite common, widespread and plentiful and the color, as well as the shape of the seed head is always nice to see. Sometimes we need to stop and have a closer look at things we would otherwise pass by unawares. I’ve been doing that a lot since I started photographing wildflowers. I see them in an entirely different way now. It’s like seeing a new world. And we appreciate sharing that experience, thanks to your great photos. Thanks Anneli. I’m glad that you enjoy the flowers! It’s the same version we have here and I was just getting some photos of it the other day. Here it closes at noon which is a bit frustrating because that means weekends are my only chance to see it. Interesting that it closes at noon. I haven’t seen that here, just at night and bad weather. It’s odd how they close at different times depending on where they live. I don’t know what would cause that. I wonder if it has something to do with the different elevations. That could be, or even temperature. I think we get a lot hotter earlier. Could be. Our temps don’t peak until late afternoon. Very pretty flower and with an interesting growth process! The exact way it transforms from blossom to seed head is unlike any other flower that I’ve seen. Fascinating; the intricacies of nature’s design, and so well captured in your images! Wildflowers have so many vastly different strategies for their life cycles. It’s amazing to me. It’s a very common flower, but when you look at it closely and get to know it it’s amazing. What a lucky find in that second image. The seed head looks a lot like a Dandelion. They use the same seed-spreading strategy as the dandelion but on a much larger scale. 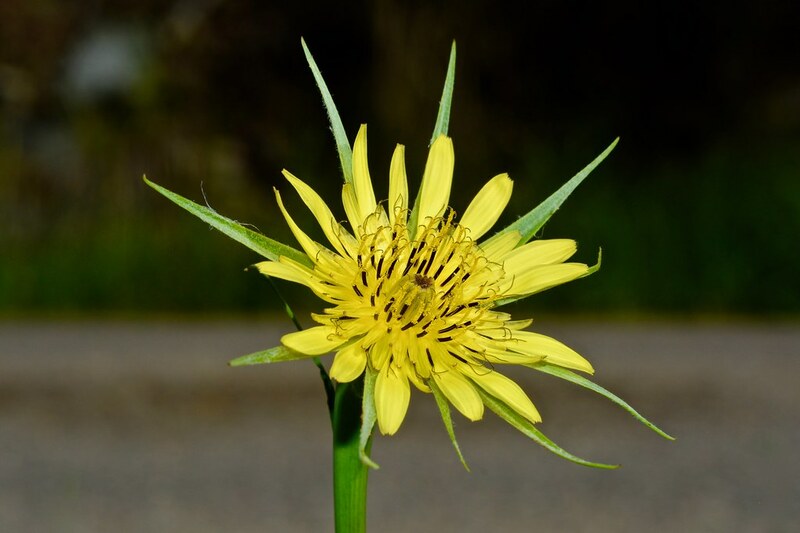 The seed head on a dandelion is about 1.5 inches in diameter: on the salsify, it is about 5 inches and the Salsify grows 2 to 3 feet tall. 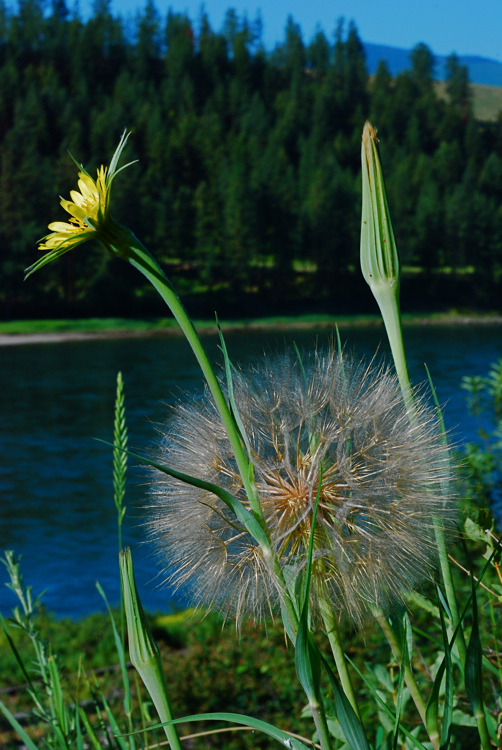 I think a plant I photographed along the river sounds like Salsify (with their large seed head). Could well be. I haven’t found a place where I can see the world wide distribution, but they are widespread and common here.. Thanks! It was lucky to run across that! That was a rather rare find. I wish I could find settings like that for other plants too. Our native “dandelions” go through much the same process, although I’m not sure if multiple days are involved. Every article I’ve found says only that they open in the morning and close by noon. I have seen that. For quite some time I wondered why fields filled with the flowers “disappeared” in the afternoon. Eventually, I figured it out. Now, I need to track some flowers next spring and see if they open and close multiple times. Salisify is still in its blooming period here. I will try to track them and see what they do. The next few days will be dark and rainy and I suspect they will mostly stay closed. They are also a flower that tracks the sun. Perhaps they close in mid day because that has caused them to have stiff necks! Heard about your site from Linda at ‘Shoreacres’. Thank you for visiting! I never miss one of Linda’s posts!